On a bad day, the rush of wind from a train in a subway station can cause endless worries about the state of our hair. On a good day, it can feel almost refreshing. But on any kind of day at all, this totally novel concept could harness the power of that wind and turn it into electricity. 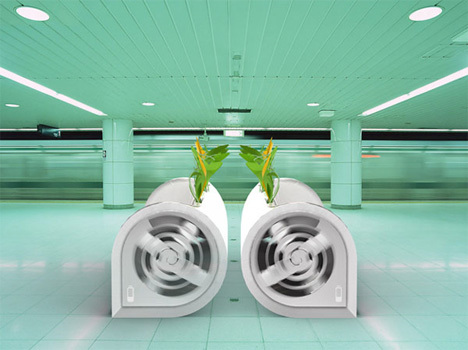 The Charger Sofa concept from designer Tao Ma makes good use of the powerful gusts that rush through subway stations over and over every day. 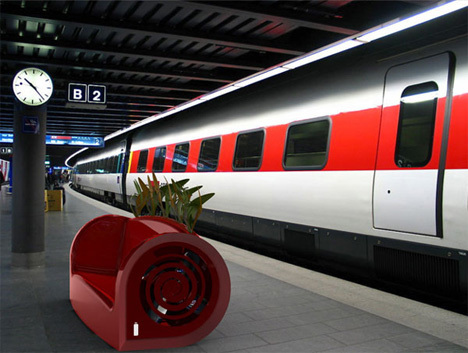 As the wind rushes over the platform, it would spin fans on either end of the Sofa, which would turn to translate kinetic energy into electricity that would be stored in the seat’s internal batteries. 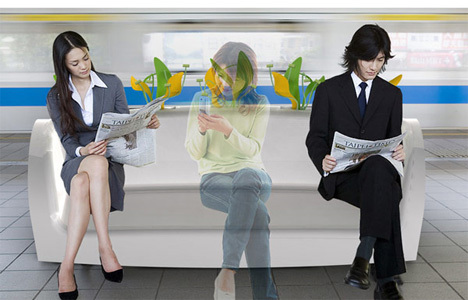 Passengers waiting for trains would then be able to utilize this power by having a seat and plugging in their phones. Several different types of connectors would be hidden among the plants on the back portion of the Charger Sofa, allowing passengers to simply sit down and pull out the charger that fits. According to the designer, the 5-10 minutes that one might spend waiting on the platform is enough time to give a mobile device just the boost that it needs before the next leg of a journey. See more in Energy & Power or under Science. May, 2011.